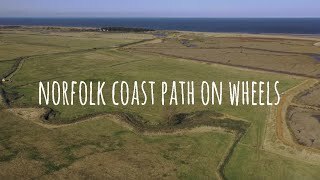 Follow the Norfolk coast across sand dunes from Thornham to Old Hunstanton on this wheel-friendly walk, with accessTOG ambassador Debbie North as your guide. This is a joy of a walk, following the coastal path that meanders along the tops of sand dunes on the edge of the sea. It’s a 4-mile section of the 84-mile Norfolk Coastal Path and this section, from Thornham to Old Hunstanton, is completely barrier free. When the tide is out the marshland is huge and there’s an abundance of wildlife to watch out for. This coastline is often referred to as the birdwatching capital of England and it’s easy to see why it’s been designated an Area of Outstanding Natural Beauty. Thornham, once a busy fishing harbour and smugglers’ haunt, is today a small coastal village separated from the sea by a vast expanse of saltmarsh. Our walk begins at Thornham Church in the middle of the village and follows the quiet coastal road down towards the sea. At the start of the coastal track there’s a short and steep incline with very rough terrain, but once up on top there’s a good track to follow all the way through to Old Hunstanton. It’s a beautiful walk whether the tide is in or out. Just before Old Hunstanton, the path runs down onto the sand, which makes it very difficult for a wheelchair. There’s a car park at this point, so we finished our walk here and drove around to Old Hunstanton. Old Hunstanton is a popular seaside village with a café, car park and accessible loos (RADAR). The lifeboat launches from here and is one of only four in the country to have a hovercraft. You can hire an accessible beach hut from Mencap and have access to their beach chair. The hovercraft is taken out to sea most Sunday mornings and is a great sight to see. The beach is wonderful and stretches out for miles – and it’s dog friendly too! A cup of tea in the hotel on the sea front makes it a perfect end to a perfect walk. I used the DaVinci Power wheel for this walk. I needed an extra push to get up the incline at the start of the walk, but once on the official path the going was easy and the track is flat all the way through to Old Hunstanton. Due to the nature of the route’s location, sand can get blown onto the path in places, which could prove hard going for pushing a manual chair.